The defeat was just the French side’s third loss in their last 11 home games while the Irish province had never won in Toulouse. The visitors though continued where they left off last weekend, racing to a ten-point lead with Ruan Pienaar touching down the game’s opening try with fly-half Jackson making up the total with a conversion and penalty. This would have conjured up memories of last week’s 38-0 victory over the hosts in last week’s return fixture. Jackson was sent to the sin-bin for the away side soon after though before Toulouse finally got on the board after 116 minutes of rugby against Ulster when Sebastien Bezy slotted a penalty for the hosts to reduce the deficit going into half-time to seven points. Tries from Andrew Trimble and Luke Marshall ensured the Irish province left with the four points while scores from Gael Fickou and Louis Picamoles ensured the game was competitive and tense up until the final whistle. Ulster are now cemented in second in Pool One, 10 points behind Saracens, with a game in hand, but Toulouse’s hopes of qualification have ended. The visitors made the perfect start as Jackson slotted over a penalty with ease after just two minutes. Ulster, ho were well on top, then made their pressure tell as scrum-half Pienaar darted through the middle of the ruck and dived over to score the opening try of the game. Jackson added the easy conversion to give the visitors a ten-point lead, 0-10. Toulouse though received a lifeline when fly-half Jackson was sent to the sin-bin by referee JP Doyle via a trip to the TMO for a deliberate knock on after 34 minutes. With the man advantage, the hosts finally got on the board after 36 minutes when Bezy slotted a penalty from the tee, 3-10. Even a man down Ulster though continued to look the side most likely to score and they though they had when Rory Scholes strolled over the try line unopposed. Bezy reduced the deficit further for the hosts two minutes after the restart but back up to their full numbers Ulster scored their second try three minutes later. The visitors scored in the corner following a superb break from Stuart McCloskey. The centre goes within metres of the line before the ball is recycled and Trimble showed some exceptional finishing skills to give Ulster the five points. Jackson though was off target with the attempted conversion, 6-15. A penalty from Bezy then pushed Toulouse into the lead for the first time in the game by a single point. 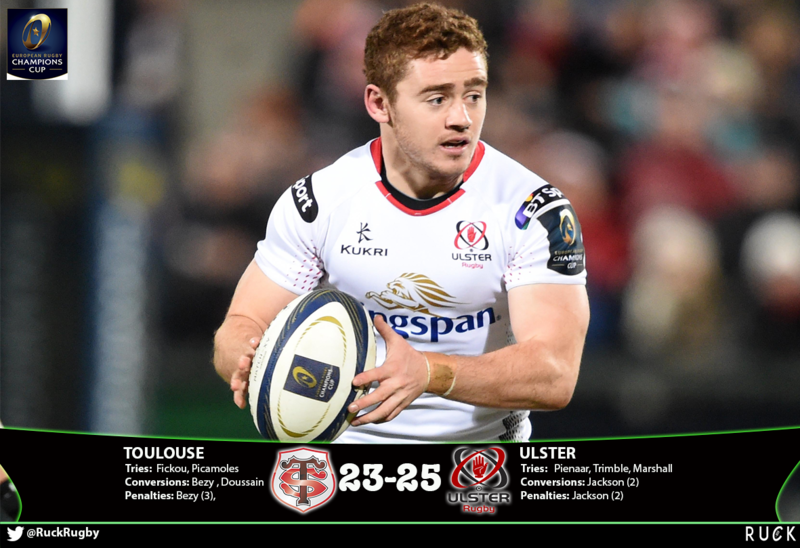 Toulouse gave themselves a glimmer of hope in the 78th minute; Picamoles drove over before Jean-Marc Doussain converted but it was not enough as Ulster ran out 23-25 winners.